This is so simple to make, and can be used over and over again. Learning colors in a book or while using paints isn’t bad, but when you are able to go outside and find colors in the natural world there is a spark! 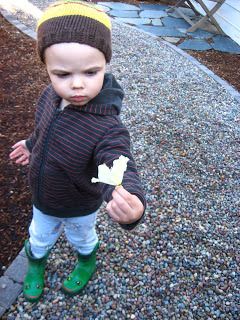 I was overjoyed to see my son yell “Look mama flower is yellow”. 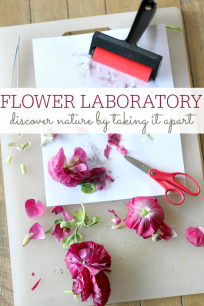 I love bridging learning from inside to outside and incorporating all different ways to learn into one activity. 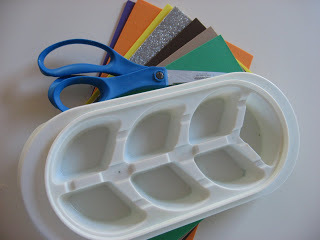 Cut your foam/paper into pieces small enough to line the bottom of the tray/carton. 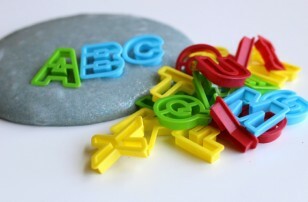 For younger kids choose colors that you kn0w they have a chance of finding a match. You don’t want it to be too easy , but too much of a challenge just frustrates everyone. 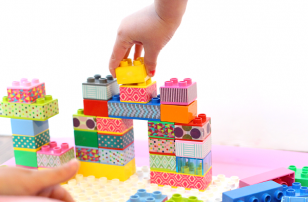 If a child is frustrated they won’t learn, our goal is to challenge and learn! 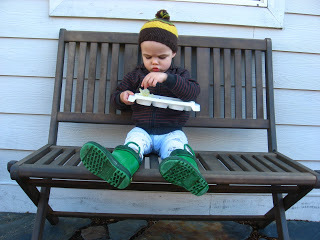 Head outside – my son couldn’t wait to get outside so as you can see he’s as per usual in his pjs! Start finding things to match. 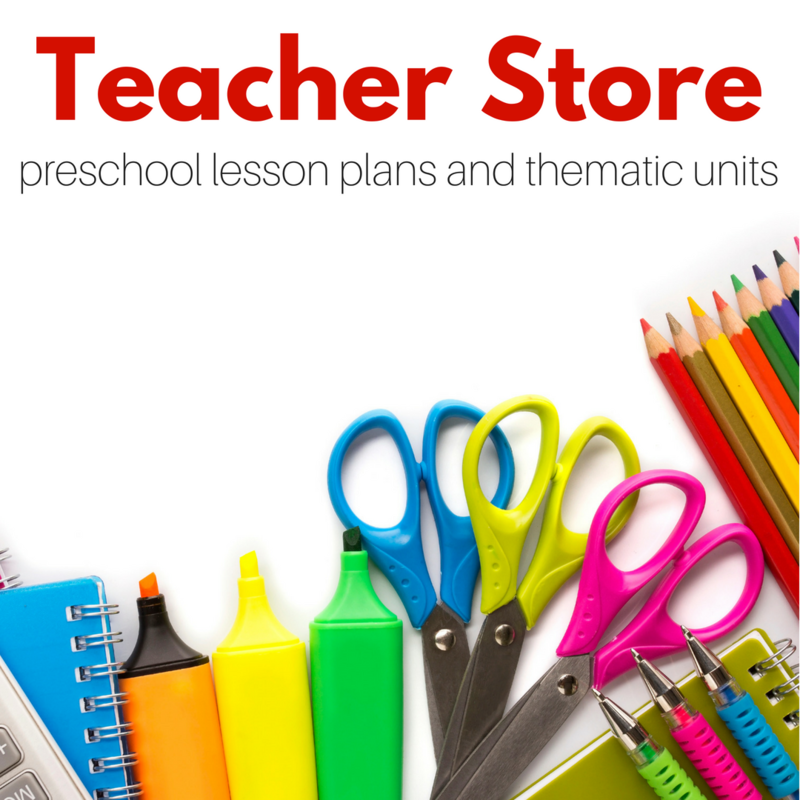 Start off by choosing a color with your child and both go looking, if they have a hard time finding a match find one, and go to it but don’t announce you have found it. Say something like “Hey Bug I think there is a match over here, can you find it” narrow down the are for them, if they still can’t pick up the object and have them match it in the tray. 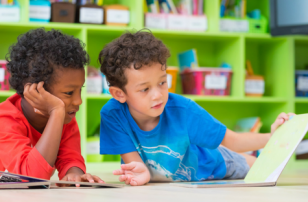 Continue working together or if they want to work all alone, watch your child explore and make connections, that is exciting and fun too! After you have made all your matches, talk about what you have found- how it feels what it does ( rock lines a path for us to walk on, a flower provides pollen for bees etc…). These books aren’t related to the activity at all, they are just some books that caught my eye at the library and I was eager to share! 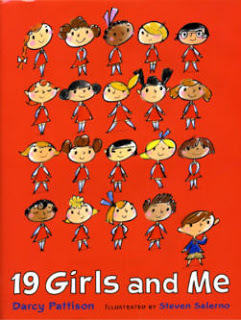 “19 Girls And Me” by Darcy Pattison fell short of my expectations which I admit were high. The overall message was great, that boys and girls don’t need to be labeled “tomboys” or “sissies” just friends. The adventures the kids get into are great too. What I didn’t like was that every adventure was suggested by the lone boy. Why couldn’t he take the backseat? There were 19 girls you’d think one of them would have a suggestion. In the author’s defense the girls did suggest things part way through each adventure but I resented that he was always the ring leader. 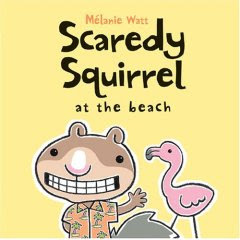 “Scaredy Squirrel : at the beach” by Melanie Watt is so funny. I love books like this that have absurd humor thrown in. Before you even read the story on the inside flap you will notice a blurb that ends with “This story is not suitable for pirates” it just makes me giggle! The story follows the most anxious squirrel you’ll ever encounter as he tries to make his own beach, only to end up at a busy one! What I love about this book are the details, the small asides will have you laughing and the main story will keep even young ones totally entertained. My son loved it especially the part about the pool being the ocean and the flashlight being the sun, even at two he was trying to tell the squirrel how wrong that was. Super fun and a great message about overcoming fears as well. “Bernard : The Angry Rooster” by Mary Wormell was a huge disappointment to me. Bernard is proud and when a rooster weather vane is put up on the roof of the barn he is jealous and takes out his anger on everyone he encounters. Here is my issue with this book.I like that the author is writing about anger, I think it’s essential we talk about that with toddlers and kids. What made me feel disappointed was that although people ask him why he is angry , and an adult can see through the illustrations that the weather vane is being put up and he is looking at it, it’s not obvious to a child. I had to really look to notice it. No one takes Bernard on saying his behavior is not acceptable or demands he explain why he hurt others. I want to label and recognize my child’s anger but it alone is not an excuse of bad behavior and that was the feeling I was left with after reading this book. My son just kept saying “Mean rooster!” I explained he was jealous and angry but I wish the book had explained it more as well. I love how your son is always in his p.j.s! What is funny is we have many of the same pairs as you so my pictures often look like yours! Thanks for all the great ideas. I LOVE the nature color match idea. I will definitely try that one with my kiddos!!! 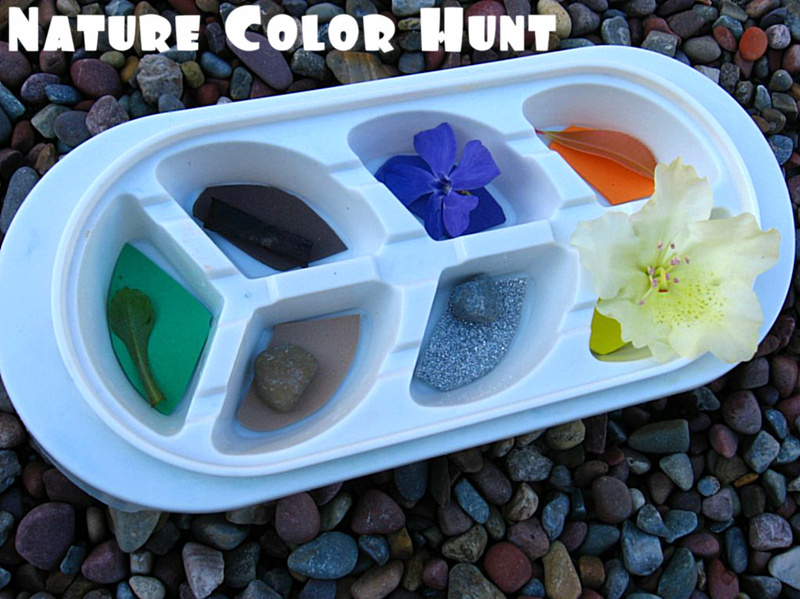 We’ve done some color hunts inside but bringing it outside never even crossed my mind. 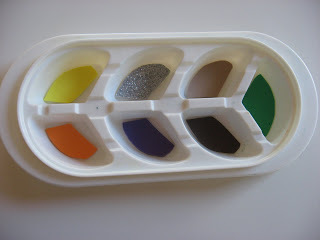 Also, I love that the tray has ALL of the colors in it instead of having separate containers for each color. Great Idea! What a great activity! This is something I’d like to do with my toddler. Great idea. This is perfect for my daughters right now. Fabulous idea – I’m going to do this with my kids for sure!!! LOVE LOVE LOVE Scaredy Squirrel!!! We have the original and the Beach story – my boys love them and I end up chuckling through the whole story as well 🙂 Glad to know there are other fans out there! Just found your blog from another blog. Love it!! Can’t wait to come back for more inspiration! What a fabulous idea! I can’t wait to do this with my boys. They are big fans of the Scaredy Squirrel series too! Oh my goodness, again just brilliant. My son LOVES to match things, this will be perfect for him and so fun. 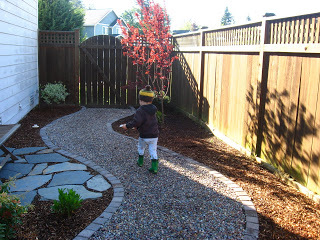 A wonderful incorporation of outside and learning. Great idea! I’m trying to focus on colors with my son, a lesson that isn’t catching (so far, EVERYTHING is yellow). I was thinking of trying to do a scavenger hunt outside and here you have it! Awesome, will definitely do this soon. This is a great activity. 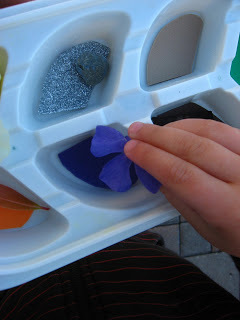 I did this the other day with my son and he had a blast, such a great way to learn colors. I posted a link to your blog on my page. Thanks for the idea!